Grammarly For Google Doc: Yes, Beta Version Is Available Now! Not everyone is a wordsmith. Only a few lucky ones are blessed with the skill of writing and exceptional grammar skills. If you don’t belong from the lucky lot, there is nothing to get disheartened because you have got Grammarly. Grammarly is the best grammar checker tool in the world. With millions of users out there, the app comes with loads of features. The app is used by even by the best of the professionals. Well, that speaks volumes about the app. ​How to Sign Up For Grammarly? Grammarly grammar checker has been designed to help its users write effective sentences. It detects possible grammatical errors and spelling mistakes in your sentences and helps you to correct them. With the use of this app, you can even improve your writing skills. The app underlines errors. You can either select the suggestion provided by Grammarly or ignore it show who’s the boss. The app is available for free as a grammarly free trial service. However, there is also a paid version of the app, Grammarly Premium. Read | Top 11 Best Plagiarism Checker Tools. Users have been long waiting to use Grammarly with their Google Docs. The requests of users have not gone completely in vain as the Grammarly team has been listening. 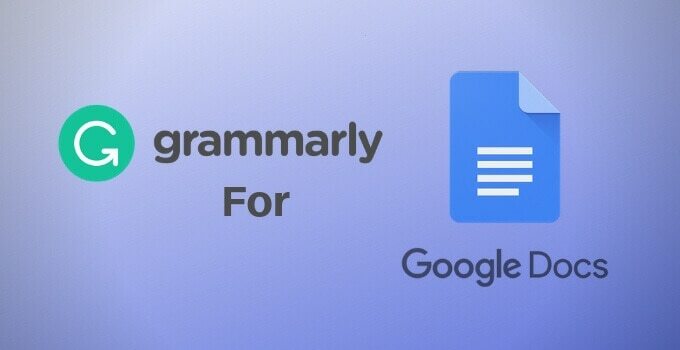 Grammarly is now available for Google Doc. To know whether you have access to the beta, enter Google doc, and if a pop-up notifies that you are working in beta, you can enjoy the Grammarly editor for now. However, this feature is available in beta for now but it is going to be open to users starting from today. To use Grammarly for Google Doc, all you need is the Grammarly extension for Chrome. You can open a google doc, and you can see the logo at the bottom in the right corner. When you start writing, the suggestions will be underlined in red. If you click on the piece, you will get to see for details given. 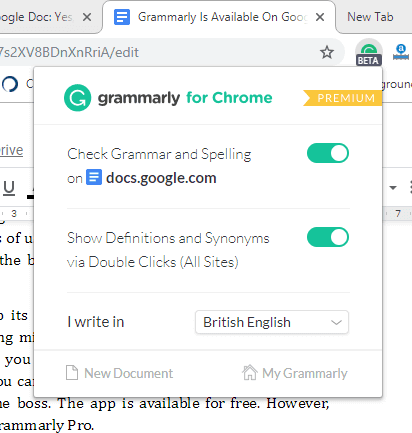 Before you begin using Grammarly for google doc, you need to make sure that you have Chrome installed in your device. 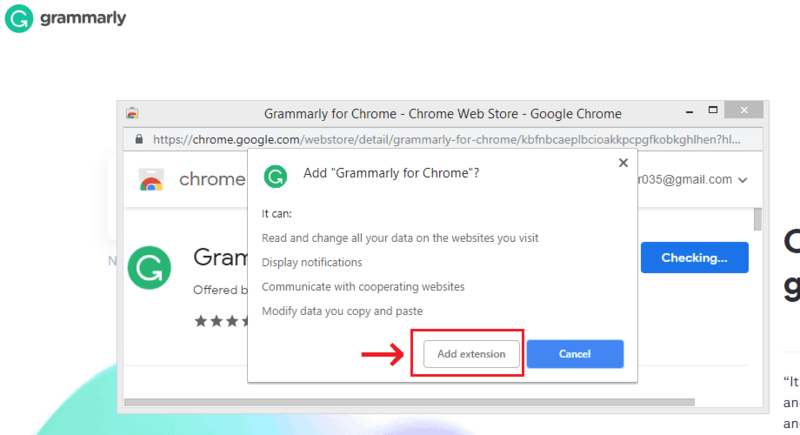 You need to download the Grammarly extension for Chrome to use it with google doc. In case, if you are not familiar with the steps, you can go through the steps outlined below. Read | Top 14 Best Punctuation Checker Tools. The steps are outlined in details along with required screenshots so that you don’t face any problem in using Grammarly for Google doc. Step-2: Now all you need to do is click on the "add to chrome" option to start the download. 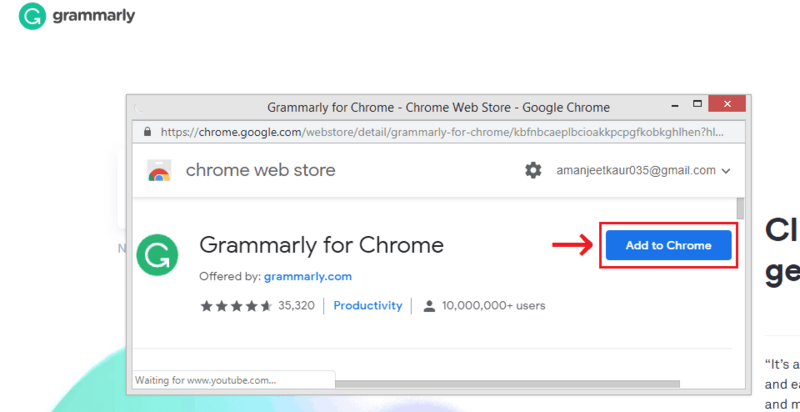 Step-3: After clicking on the "Add to Chrome" option, You will see a Popup box which will redirect you the Grammarly's chrome web store page. Simply again click on the Add to chrome option. Step-4: Now, click on "Add extension" option. Step-5: Now download will start. Once the download and installation are completed, you can use Grammarly Beta on Google Doc. But, make sure you have a working Grammarly account. Step-6: If you already have a Grammarly account, all you need to do is sign-in. In case, you don’t have an account you are required to create one. You can create a Grammarly account with your email ID. Here's the step-by-step process to create a grammarly free trial account. Step-1: Now, First install the Grammarly extension by following the above steps and after that click here again. Step-2: Now, Click here and visit the official Grammarly website. Step-3: Use any non-used email ID and use a strong password to sign up on the very next step, and after that, hit on green sign up button. However, you can also use the "Continue with Facebook" or "Continue with Google" option. Step-4: Now, here on the next screen, you will be asked to Personalize your Grammarly account. However, you can also use the Skip option. Step-5: Now, you will be asked to choose an option: If you want to use the premium services of Grammarly, then you should click on the "Get Grammarly premium" option or simply click on the "Continue to Grammarly It's free" option. That's it. You have successfully created the free Grammarly account. Read | 7 Best Grammarly Alternatives. Overall, it can be concluded that Grammarly is the best grammar checker that you can use. It is any day better and more efficient than any other grammar checker app out there. Now that you know the steps to use it with Google doc you can make the best use of the app.